The Texas Road Rash has officially joined the National Roller Cup inline racing series (NROC). 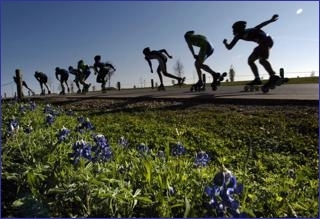 "We wanted to be part of a series that supports inline skating and that partners us with other marathons in the United States," said Terri Waggoner, a marketing specialist for the city of Round Rock. The Road Rash is the annual inline marathon of Round Rock, which bills itself as the Sports Capital of Texas and is 17 miles north of Austin, the state capital. The Road Rash (April 6) will be the second event — the first outdoor event — of the NROC season. This year's Road Rash will include a full and half marathon and — for the first time — an elimination race. Since its founding five years ago, the Road Rash has become a crowd-pleaser. The race is professionally run and held on a smooth course that loops around Old Settlers Park. Skaters are provided with dinner the night before, event T-shirts, goodie bags, live music and a post-race lunch that includes "adult beverages." "Our goal is for people to come to the Road Rash and try us out," Waggoner said. NROC is a new inline racing series developed by the Inline Planet. Its goal is to bring a new layer of excitement to inline racing in 2008. NROC will rank skaters using two separate systems: one for pros, the other for non-pros (recreational and fitness skaters). The pro system will assign points based on order of finish in several categories. The non-pro system (NROC Prime) will provide performance scores to all marathon participants. The Inline Planet expects to announce another addition to the NROC calendar next week. The NorthShore Board of Directors is expected to consider a proposal from NROC on Jan. 24. Sign up for the Road Rash at www.texasroadrash.com. Come get a rash in Round Rock (April 5-6) at the 5th annual Texas Road Rash inline skate marathon, half marathon and (new for 2008) elimination races. The event is on a smooth, looped course through Round Rock’s beautiful 570 acre Old Settlers Park and contestants compete for cash prizes, Texas Road Rash cheesegrater trophies and official PyroApparel jackets. Registration includes dinner at packet pickup during the elimination races, course support, chip-timing, event T-shirt and goodie bag, live music and a Taste of Texas at the finish line to include adult beverages and lunch for participants. Categories are Pro-Elite Skaters, Pro Masters-Elite Skaters age 35+, Open and Un-Timed Recreational. Early registration (through March 14) is $60 for full marathon and $40 for half marathon and $20 for elimination races. Sign up today at www.texasroadrash.com.